University of New England (UNE) PhD student Kirsten Drew travelled to Macquarie Island last week aboard the Australian Antarctic Division resupply ship Aurora Australis. She will spend a week on the sub-Antarctic island with a colleague from New Zealand, Dr Alex Fergus, collecting data as part of a UNE study of the ecology and management of chickweed. Since rabbits were eradicated from Macquarie, attention has now turned to studying its three main weeds, for potential control, and Kirsten is assessing the use of herbicides in this World Heritage environment. Two of her supervisors, Associate Professor Susan Wilson and Professor Brian Sindel, from the School of Environmental and Rural Science, describe what Kirsten might expect working in this inhospitable climate. Pollution specialist Susan Wilson travelled to Antarctica in 2015 and says that not even an Armidale winter can prepare you for the cold. “The conditions are extreme; the cold is very cold and the wind strong. It’s pretty much the cloudiest place on Earth and sometimes you can’t see more than a few metres in front of you, or the person you are working with. It snowed while I was on Macquarie, which presented extra challenges locating the white pegs in our plots and excavating buried seed bags. “There’s a well-equipped research station in the island’s north and five warm, well-supplied permanent huts where you stay overnight while working in the field. On resupply voyages, when you can only be on the island for a week, you have to work quickly and maximise your time in the field because there’s so much to do. You usually start at 7am in the morning and get to the hut as it gets dark, carrying with you safety, navigation, communication and research equipment as well as your personal gear. “Hypothermia is a real and constant risk. If you are recording data, your hands get cold. We wore woollen gloves with dishwashing gloves over the top to keep them dry and I used the warming heat bags inside my gloves for extra warmth. 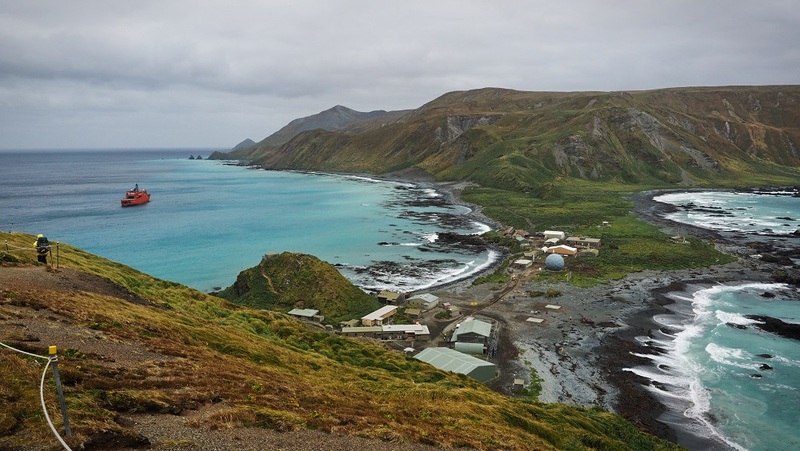 Brian Sindel, a weed professor, has been to Macquarie Island three times. On his first expedition, in 2012/13, the trip down lasted 21 days, instead of the scheduled five, because the ice-reinforced ship was rerouted via Antarctica and then diverted to rescue a French yachtsman whose boat had sunk in the Southern Ocean. “It really is an expedition to get to Macquarie – usually three days passage from Hobart. You could potentially reach the island and then not get ashore at all due to foul weather. Everything is subject to the weather conditions. It’s one of the last great frontiers in the world. “The average temperature ranges between 3-7°Celcius throughout the year, night and day. If it’s snowing, it will obviously get down below that, and then you get the wind-chill factor, which makes it really cold up on the plateau, where the lakes and streams can freeze over. There’s a lot of climbing up and down steep slopes, which can be physically demanding with a 20-30-kilogram pack on your back when the wind’s trying to blow you over and you are cold and wet. Even with ‘waterproof’ boots, wet feet are inevitable due to the often wet and boggy conditions. It’s not uncommon to sink down to your knees at times. “Our equipment needs to be extremely weather-proof and able to withstand scavenging skuas, inquisitive penguins and wallowing elephant seals. During the past five years we’ve been working on Macquarie, our buried seed bags have been expelled by ice heave and blown away, and research sites buried by elephant seals and lost under sand and landslips. “But there are not too many people who have been to Macquarie. The common question when you tell people that you are going down there is: ‘do you need an assistant?’ People know of the wildlife, its conservation value and what an amazing place it is. Since 2012, UNE researchers have carried out two major Australian Antarctic Division (AAD) research projects on Macquarie Island in a bid to better understand the weeds that threaten it. They have recently approached AAD to establish a pilot weed eradication project on a small part of the island.